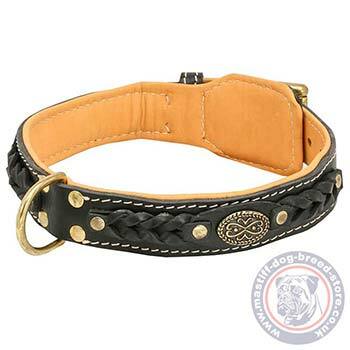 Choose this royal dog collar with soft leather lining and braided design. Sizes: 19-40 in (48-100 cm). Colors: black, brown, tan. Handmade leather dog collars are luxury dog accessories, designed and produced with attention to every detail, that makes it look gorgeous and be maximum durable for mediuma nd large, strong dogs. This royal dog collar design is the best choice for Dogue De Bordeaux to make your dog look special and underline its pure breed and proud look. These Dogue De Bordeaux collars have strong stitches and rivets that ensure durability and strength in active use for many purposes. Braided leather dog collar attracts looks with its elegant braids and brass medals. Natural color Nappa lining contrasts with surface leather. 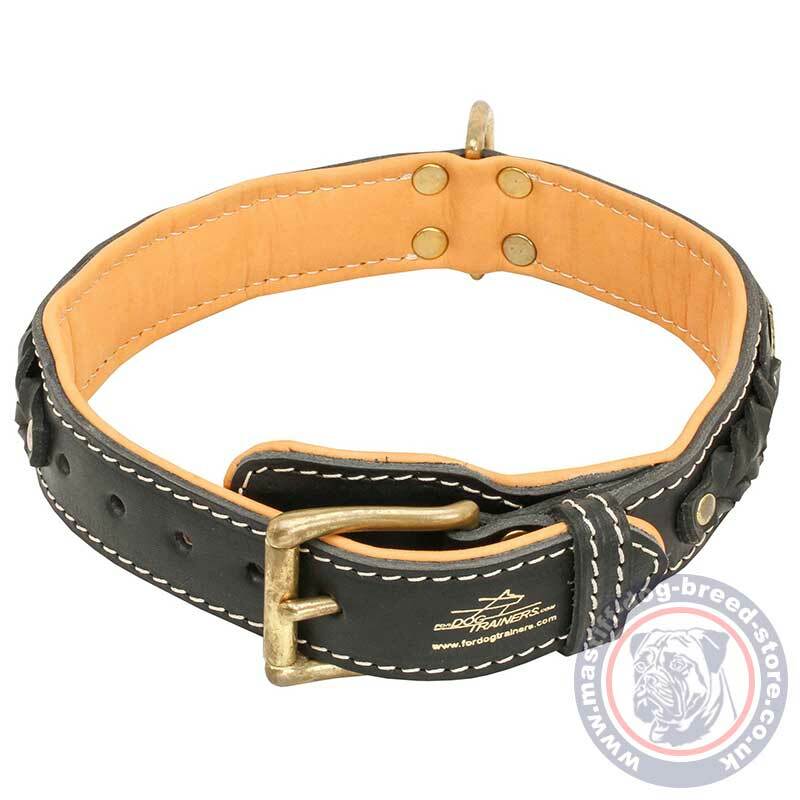 The handmade dog collar is regulated with a classic, strong brass buckle. The cast D ring is securely adjusted with rivets and is comfortable for lead adjusting. These luxury dog collars are the result of rich experience and professional skills of our craftsmen since 1995. All the hardware and decorations are securely riveted for the best durability. The hardware is fully rustproof and corrosion resistant. 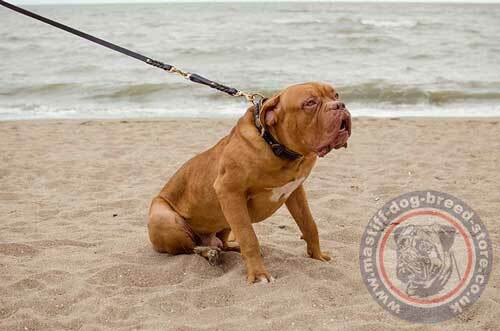 The distinctive feature of these Dogue De Bordeaux collars for large dogs is their design. 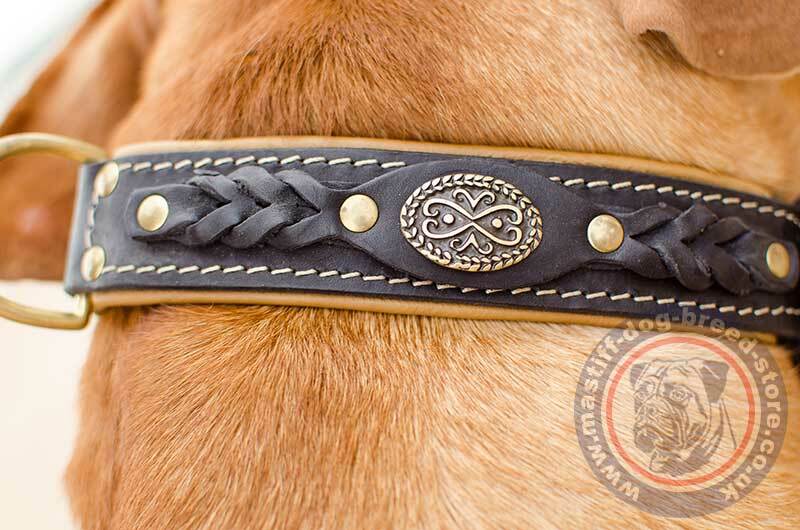 Soft lining, quality leather, braids, medals, strong buckle and ring create super luxury dog accessory for the most exacting customers!